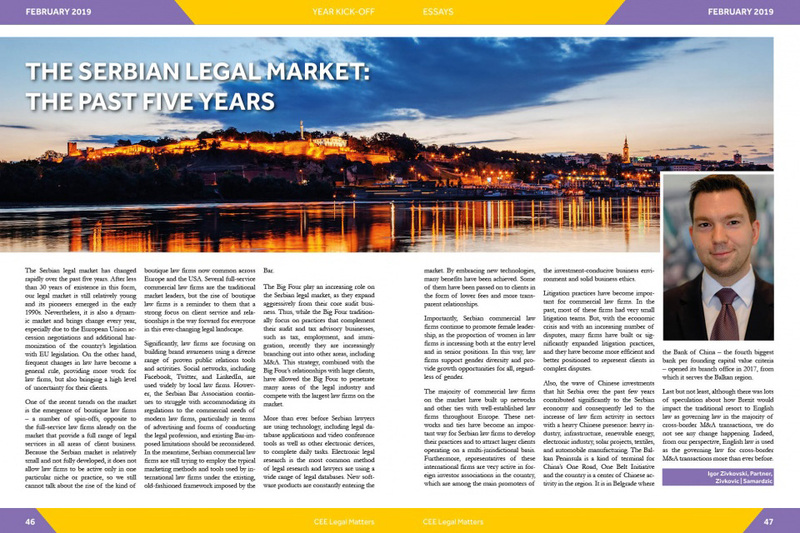 Igor Živkovski, Živković Samardžić Corporate and M&A Partner, wrote an essay for the CEE Legal Matters Magazine’s February issue on the topic: How has the Serbian market changed in the past five years? In the essay, Igor stated that the Serbian legal market has rapidly changed in the past five years: “After less than 30 years of existence in this form, our legal market is still relatively young and its pioneers emerged in the early 1990s. Nevertheless, it is also a dynamic market and brings change every year, especially due to the European Union accession negotiations and additional harmonization of the country’s legislation with EU legislation. On the other hand, frequent changes in law have become a general rule, providing more work for law firms, but also bringing a high level of uncertainty for their clients”. When it comes to law firms’ focus on building brand awareness using a diverse range of proven public relations tools and activities, Igor underlined that social networks including Facebook, Twitter and LinkedIn are widely used by local law firms. As one of developing trends on the market he emphasized the fact that Serbian lawyers more than ever before use technology, which primarily includes legal databases applications and video conference tools as well as other electronic devices, to complete daily tasks. Electronic legal research prevails as the most common method of legal research and lawyers use a wide range of legal databases to perform research. Also, Igor noted that the majority of commercial law firms on the market have built up a network and ties with well-established law firms throughout Europe. Thus, international law firm networks have become an important way for Serbian law firms to develop their practices and to attract larger clients operating on a multi-jurisdictional basis. Full text of the essay is available here. CEE Legal Matters is a print and online publication for and about lawyers interested and working in Europe’s emerging legal markets, featuring news, interviews, analysis, opinion, and more with a mission to be the go-to source of information about lawyers and legal markets in Central and Eastern Europe. You can visit Magazine’s website and subscribe here. This Article was originally published in Issue 6.1 of the CEE Legal Matters Magazine here.